The Lion cocktail was created by Dave Powell at Corner Social in New York City, and it does indeed have a mighty roar. This summer cocktail is spicy-sweet and tropical, with flavors like jalapeño, pineapple, blueberry and mint. 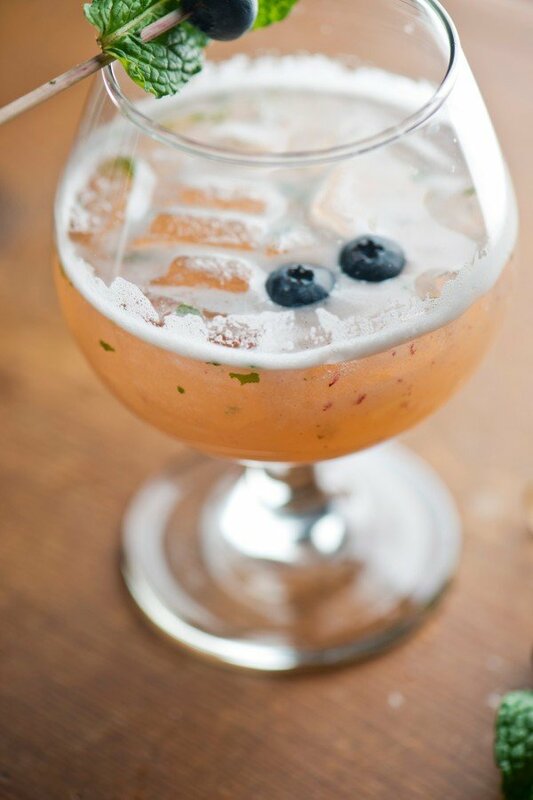 With this drink recipe involving actual pieces of jalapeño, mint leaf and blueberry, you might expect the instructions to call for muddling. But they don’t, because muddling the jalapeño would release too much of the oil, causing the drink to shoot out spicy flames and singe the tongue and sinus membranes of the poor fool who drinks it. Shaking releases enough – although you can muddle the mint and/or blueberry if you’re inclined to want to enhance those flavors. Fill a shaker haflway with ice. Pour in all ingredients, liquid and otherwise, and shake well. Pour, ice and all, into a snifter. Garnish with a mint leaf wrapped around a blueberry. Would like to make at home, had on at brunch on Saturday and it was awesome. Mine was made with mango instead of pineapple.